Q. 12: Isn't the SSPX schismatic? Was Archbishop Lefebvre (along with his co-consecrator and the four bishops whom he consecrated) excommunicated also for having done a “schismatic act” (as well as for consecrating without a pontifical mandate, question 11)? No. A first argument to that is already given (question 11,1). What, moreover, constitutes a schismatic act? Not the mere deed of consecrating bishops without pontifical mandate. The 1983 Code of Canon Law itself lists this offense under Title 3 (abuse of ecclesiastical powers) and not under Title 1 (offenses against religion and the unity of the Church) of its penal section (Book 6). Nor would it be a “schismatic act” to consecrate against the express wish of the Holy Father. That could amount to disobedience at most. * But disobedience does not amount to schism; schism requires that one not recognize the authority of the pope to command; disobedience consists in not obeying a command, whilst still acknowledging the authority of the one commanding. “The child who says ‘I won’t!’ to his mother does not deny that she is his mother” (Fr. Glover, in Is Tradition Excommunicated? p. 99 [appendix 2]). 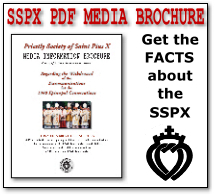 As for the faithful, threatened by Pope John Paul II himself with excommunication if they adhere formally to the schism (Ecclesia Dei Afflicta, July 2, 1988), do they indeed incur any excommunication for going to SSPX priests for the sacraments?